Gravity: Original Motion Picture Soundtrack is the soundtrack album of the 3D science fiction thriller film Gravity, written by British film composer Steven Price. The album was released in 2013 via WaterTower Music label. Price's score was universally applauded by film critics and audiences alike, leading Price to win and receive nominations for several Best Original Score awards at ceremonies, including a BAFTA Award, a Satellite Award and an Academy Award, as well as a Golden Globe Award nomination. "We knew we needed to express silence. We didn't want the score to be descriptive, but psychological and emotional. We composed a score which is expressive of surroundings. Here the music is moving around you all the time." 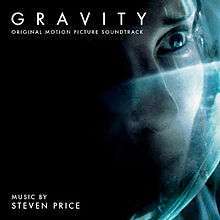 Composer Steven Price was originally called in to help out for three weeks on the music design of Gravity. After having a creative discussion with director Alfonso Cuarón, Price began coming up with a template of sounds and noises that eventually led to him being hired as the film's composer. As work began on the film's score, Cuarón and Price set ground rules for distancing the score from conventional Hollywood-style action scores such as omitting the use of percussion. "Ordinarily in an action film you're often competing with explosions and god knows what else, whereas with this [movie] music could do things a different way," said Price. "With everything we did we would try and look beyond the normal way of doing things. [For] some of the action sequences where there are explosions, I knew that [...] those explosions had to be inherent." The score was recorded in small groups or single instruments as opposed to a collective orchestra in order for each sound to be electronically processed and mixed individually to create a layered and surrounding effect. Steven Price's score has been acclaimed by critics and audiences alike, in particular for its two final tracks, "Shenzou" and "Gravity." It was nominated for and won multiple awards in the Best Original Score category at several ceremonies. Indeed, it received a nomination for Best Original Score at the 71st Golden Globe Awards, and won Best Original Music at the 67th British Academy Film Awards and Best Original Score at the 86th Academy Awards. James Southall of Movie Wave awarded the album five stars out of a possible five and said that "it feels like the most intelligent and most satisfying score for a science fiction movie since Ennio Morricone's stunning, dishearteningly lambasted Mission to Mars." All tracks written by Steven Price. "Airlock" is actually not played during the film. The beginning of "Aningaaq" is instead used in the scene it was intended for. Track 15 is mistakenly entitled "Shenzou" while it should be "Shenzhou". Credits adapted from AllMusic and from the liner notes of Gravity: Original Motion Picture Soundtrack. ↑ Singh, Suhani (October 3, 2013). "I didn't want Gravity to be a sci-fi or a fantasy film, says director Alfonso Cuaron". India Today. Living Media. Retrieved October 7, 2013. ↑ Lindsey Bahr (February 21, 2014). "Oscars 2014: How Steven Price created a 3-D score for 'Gravity'". Entertainment Weekly. Retrieved August 28, 2016. ↑ Schweiger, Daniel (September 30, 2013). "Interview with Steven Price". Film Music Magazine. Global Media Online, Inc. Retrieved October 7, 2013. ↑ Rosen, Christopher (October 4, 2013). "'Gravity' Composer Steven Price On The Film's Incredible Soundtrack". The Huffington Post. AOL. Retrieved October 7, 2013. ↑ Watercutter, Angela (October 7, 2013). "The Sound of Silence: How Gravity Created a Terrifying Score for Outer Space". Wired. Condé Nast Publishing. Retrieved October 7, 2013. ↑ Girkout, Alexa (October 3, 2013). "How Do You Score Outer Space? Silence and 'Overwhelming' Sound, Says 'Gravity' Composer". The Hollywood Reporter. Prometheus Global Media. Retrieved October 7, 2013. ↑ Graydon, Danny. Review: Gravity. Empire. Retrieved on 2014-03-10. ↑ Clemmensen, Christian. Review: Gravity. Filmtracks. Retrieved on 2014-03-10. ↑ Trate, Robert T. "Gravity Soundtrack Review". Mania. 1 2 Southall, James. "Gravity soundtrack review". Movie Wave. ↑ Napier, Jim. "GRAVITY Soundtrack Review - Steven Price's Score is Out of this World". Screen Invasion. ↑ Scroer, Brendan. Review: Gravity. Sputnikmusic. Retrieved on 2014-03-10. ↑ Simons, Pete. "Gravity (Steven Price)". Synchrotones. ↑ "Gravity [Original Motion Picture Soundrack] - Steven Price | Credits". AllMusic. Rovi Corporation. Retrieved October 7, 2013.